Hello my stampy friends! It is the first of the month! 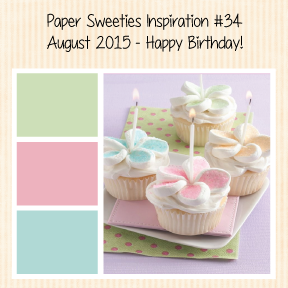 Paper Sweeties Inspiration Challenge ! You will have lots of chances to win lots of prizes!!! Here is our GORGEOUS August Inspiration photo! 1. CREATE a NEW project based on the current inspiration board using ANY of your favorite crafty supplies — receive an EXTRA VOTE if you use something from Paper Sweeties such as a stamp, die or embellishment! 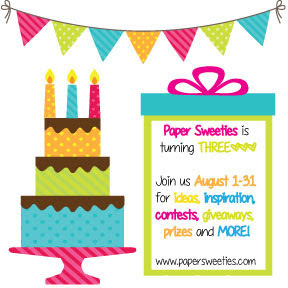 If you don’t have any stamps from Paper Sweeties yet, we have somecomplimentary digital images for you to try out! Use this month’s board as a starting point for your project — be inspired by one or more of the colors, shapes, theme — ANYTHING GOES! 2. POST a DIRECT LINK to your project in our link gallery below — please link to your project post (not your entire blog) so we can easily find your creation. You do not need to have a blog to enter — you can use any of our online galleries to upload your project: Flickr, Pinterest, Facebook orSplitcoast Stampers (keyword papersweeties)! Since the SWEETIE paper dolls are the foundation and starting point of this line, I decided to showcase the dolls and some of their cute outfit sets! The dolls are ready for the party! Because we are celebrating out 3RD Birthday, some of our ALUMNI Designers are joining us!! OMGoodness, Mackie! From the first second I saw this card, I loved it. How cute to put the three dolls together on the same card. And, the fence and banner are adorable. Love all the patterns, and your coloring on the hair is amazing. Love love love this! LOVING that fence and loveeeeeeee the clouds!!!!! Amazing Mackie!!! Love the Sweeties kids hanging out together for a party!!! Sweet idea for them to hold the banner! Awesome sweet card, Mackie! Love how you have Emma, Jake, and Abigail altogether for the celebration! Perfect coloring as always along with pretty papers! Such a sweet card...love it!!! Love the trio of dolls, Mackie! Your card is adorable, and their sweeties clothes are the perfect colors & patterns for the challenge photo. Love how the girls are holding the banner! What a fab scene Mackie! Love the little dolls and their cute little outfits! Mackie, I LOVE how you featured Emma, Jake and Abigail. Such a wonderful design!! Super cute card Mackie! Such a fun little scene! CUTENESS GALORE - love all the fun details you have added to this delightful scene!! 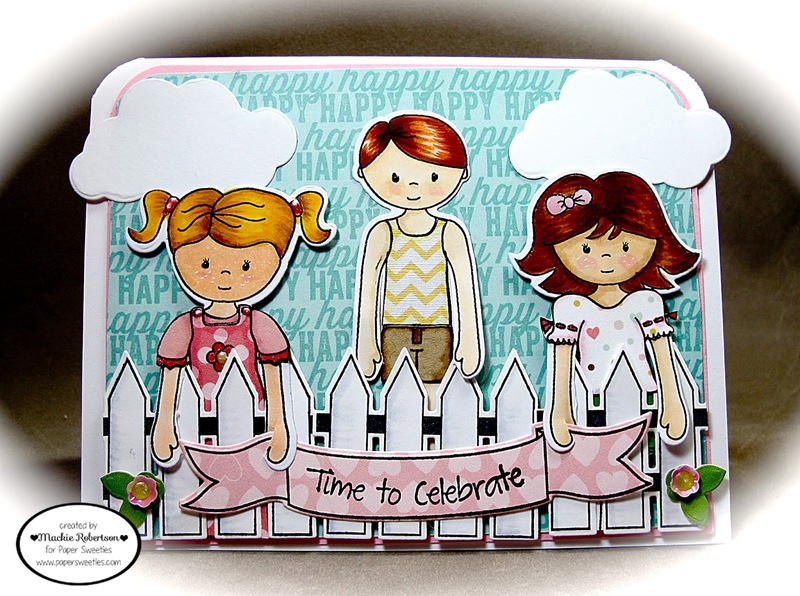 Way to go - such a wonderful card for the celebration!! So cute - you did an awesome job showcasing the sweeties! Cute as can be! Such a darling, little scene, and way to color those Sweeties up right! Gorgeous! ACK!!! This is just as cute as can be, love this little scene Mackie. The coloring of their hair is fantastic!! This is just adorable! I love your coloring and those paper pieced cuties!